As a website owner, data is your lifeline for making informed decisions. And when it comes to data, Google Analytics (GA) is one of the best tools for capturing and analyzing data. However, using Google Analytics isn’t exactly a cakewalk. It’s easy to become overwhelmed and only look at basic reports that GA creates by default. These reports provide only superficial insight on how users interact with your site. If you know what to ask and look for, you can find out exactly what’s happening on your site. In this post, I’ll take a look at some essential custom reports (and their metrics) that you should use to take decisions that grow your business. If you run an eCommerce store, you probably rely on more than one source for traffic. Ideally, you want to know how each traffic source affects customer behavior. 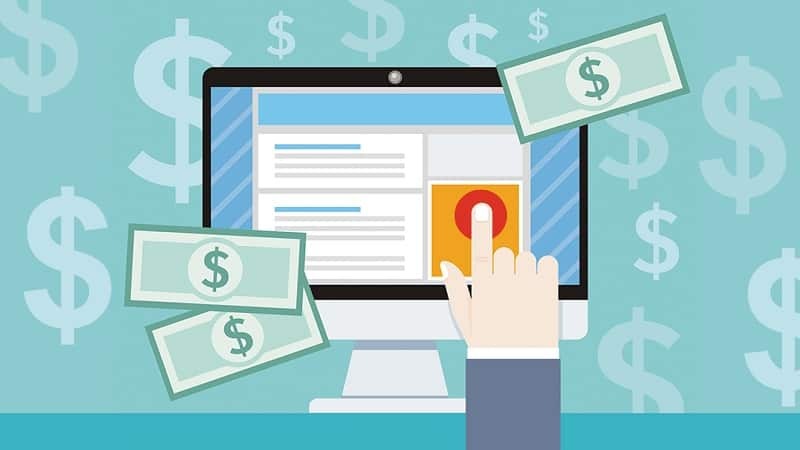 For example, you may want to know whether customers who land on your product page through a Facebook ad campaign are more likely to purchase than those from a PPC ad campaign. Such knowledge allows you to effectively divert more resources towards traffic sources that are actually beneficial to you. The Ecommerce traffic report focuses on two metrics known as the average order value and per session value (money brought in) for each traffic source. First, enable Ecommerce tracking on your site. Follow Google’s instructions here to do this. 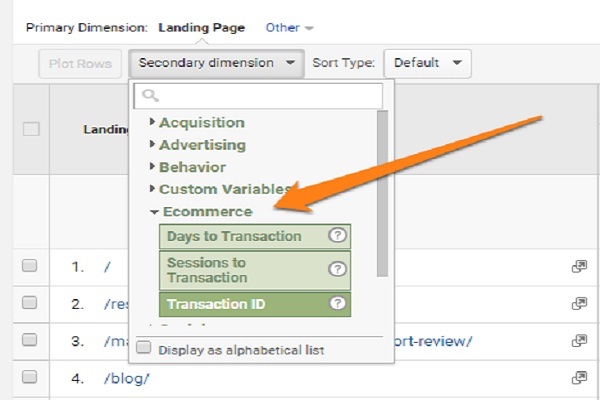 Next, log into your Analytics account and go to Acquisition -> Traffic -> Channels. In the secondary dimension, click on “Ecommerce” and select your target metric. Social media traffic is often hard to measure. You may know how much social traffic your site receives but that information alone is not enough to help you make informed decisions about your social media strategy. However, the social media analysis report provides three vital pieces of information that help you plan your next move. The report is organized into three sections known as the summary, content analysis, and device analysis. The summary tab reveals where traffic comes from, why and how often it comes, and most importantly traffic from which source converts the most on your site. The content analysis section of this report doesn’t measure your tweets or social shares. Instead, it reveals your popular pages which help you realize which type of content attracts social media users. Last, the device analysis section provides data on which platform (desktop or mobile) is more conducive to social conversions. This lets you target your ad campaigns for one platform over the other. 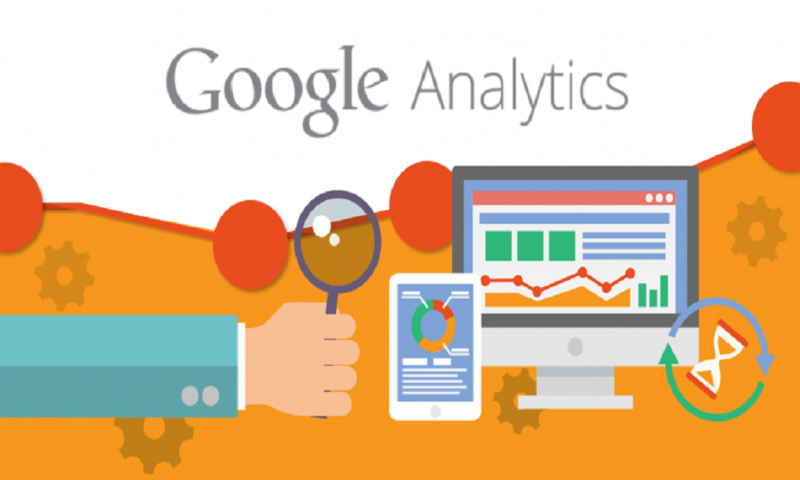 Head over to the Google Analytics Solutions Gallery. 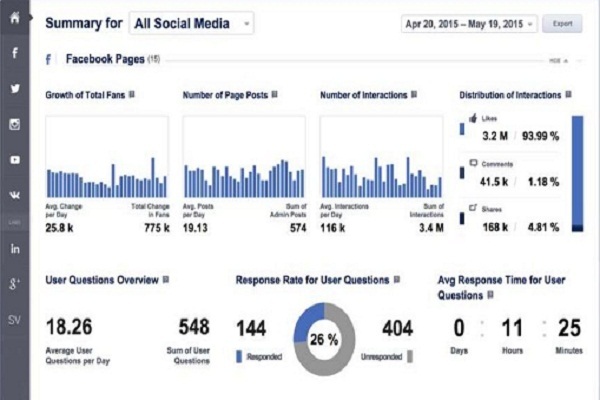 Then navigate to the “Social Media Dashboard” report by Justin Cutroni. Click on ‘Import’ to bring it into your GA account. And voila! Your analytics report will be ready. There is a direct relationship between a number of landing pages and conversion rates, as HubSpot’s survey discovered. 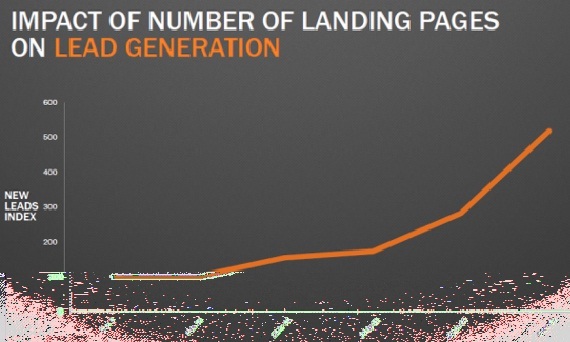 Simply put, the more landing pages you have, the more leads/conversions you’re likely to have. 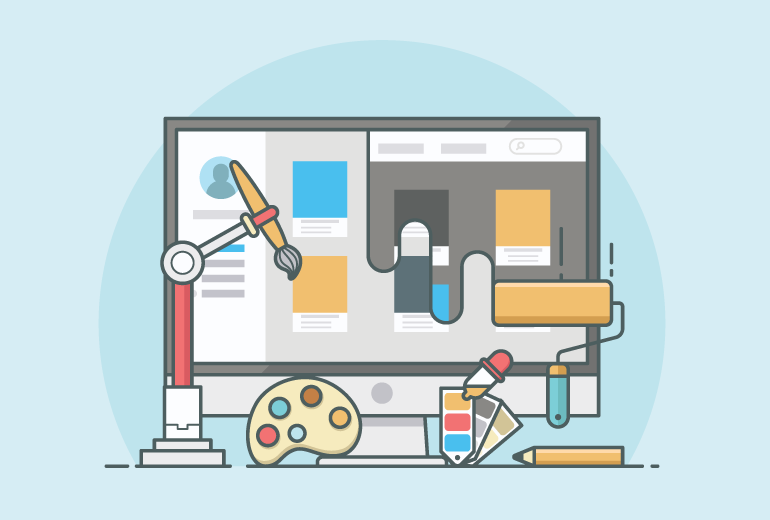 A larger variety of landing pages also gives you room to experiment heavily. This is why a common growth hacking tactic is to create multiple variations of the same page with minor differences in copy/design, then direct traffic (paid or free) to it. GA does a great job of telling you which of your landing pages are performing well, which ones aren’t. 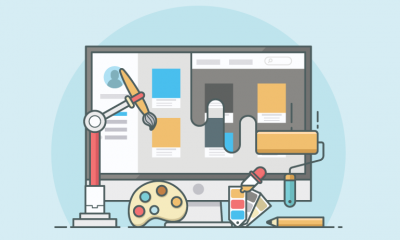 This can help you decide the design, copy and value proposition of your future landing pages. 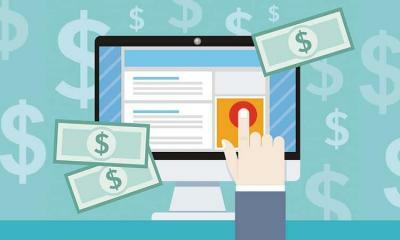 This report is particularly useful if you are running any paid traffic to these landing pages. 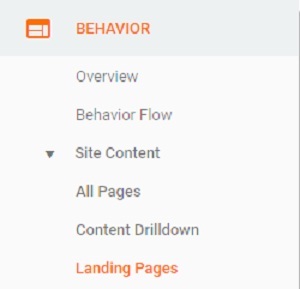 Log into your GA and go to Behavior -> Site Content -> Landing Pages. This will show you your site’s top landing pages and their performance. You can also get more detailed analysis by picking the appropriate secondary dimension. People behave differently depending on the day of the week (and time of day). Knowledge of these minute behavioral changes allows you to tailor your page and messaging to accommodate user motive at any given time. For example, your data might reveal that your sign up page experiences an abnormally high bounce rate on weekends. In this case, you might choose different copy or design to convert distracted visitors on these days. Another example is using the time of day report to figure out when to publish your blog posts. If data shows that your traffic peaks in the evening, it might be best to publish your new content then. Over time, you’ll accumulate historical data that lets you plan your campaigns during the window when it’s likely to have the greatest impact. Metrics used to determine how users behave include page views, bounce rate, and average session duration. Keep in mind you can change the metrics to anything you want (in case you want to take a deeper look). This report comes courtesy of Dan Barker over at Barker.co.uk. Since it’s a custom report, you’ll have to first import it into your GA. Follow the instructions on the above link to do this. Here, the numbers represent the 24 hours in the day, i.e. 13 equals 1 PM. A comprehensive review of campaign effectiveness must take into account the cost of doing business. This is what the campaign cost report measures. Simply measuring revenue and conversions isn’t enough. 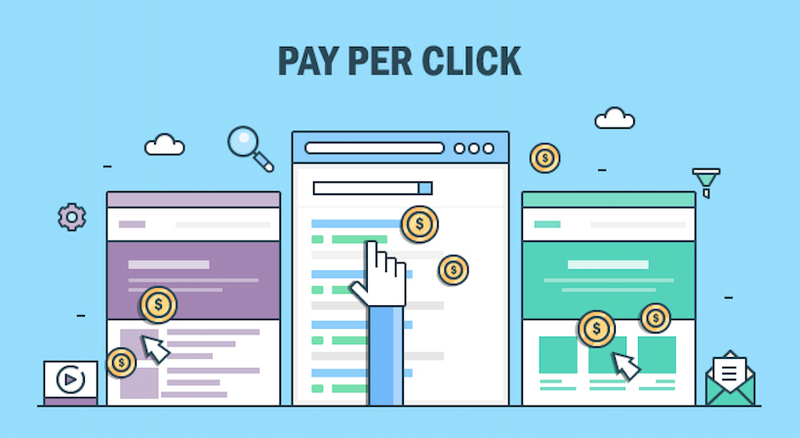 You also need to understand your cost-per-click (CPC) in relation to your revenue. 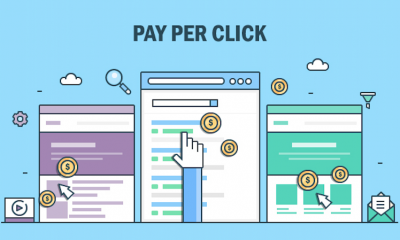 For example, if you have a CPC is $2 and the resulting per session value is $2.50, then you are probably losing money per click (accounting in overhead costs). This lets you make changes to your campaign before it’s too late. The ultimate goal is to widen the gap between these two values. And the wider the gap, the more profitable your campaigns are. Using this report requires a bit of elbow grease. You’ll have to first upload cost data for each channel. Google has a detailed page on how to import this data here. Once you’ve imported your data, go to Acquisitions -> Campaigns -> Cost Analysis to find this report. Trying to rank for broad keywords is extremely difficult. More importantly, such keywords are generic in nature and used commonly by customers during their research phase. Near the end of their purchasing cycle, customers use long tail keywords. These keywords are longer than a few words. And they have less competition which translates into a lower cost-per-click and easier to rank. With the long tail keyword conversion report, you can track the performance of numerous such keywords simultaneously to determine which one makes you the most money. Metrics measured to reveal this insight include time on page, bounce rate, and goal conversion rate. Google Analytics doesn’t have a built-in filter for short or long-tail keywords. However, it does support regular expressions. These can help you filter out 1, 2, 3, 4-word keywords (and beyond). Using regular expressions to create custom audiences is beyond the scope of this article. OptimizeSmart has a good introduction to creating keyword filters using these expressions. For example, one visitor may use a laptop, another a smartphone, and a third may land on your site through a tablet with a separate browser installed. All these combinations can be a headache when it comes to UX. You want to design your site to please the segment of your audience that provides you the most conversions. With the conversion rate report, you can measure traffic volume and conversion rate based on browser, browser version, and device type. Subsequently, you can use this information to identify and prioritize UX issues. This report requires you to first setup goal tracking. Use this GA article to get started. Once you’ve set up goal tracking, go to Conversions -> Goals -> Overview. 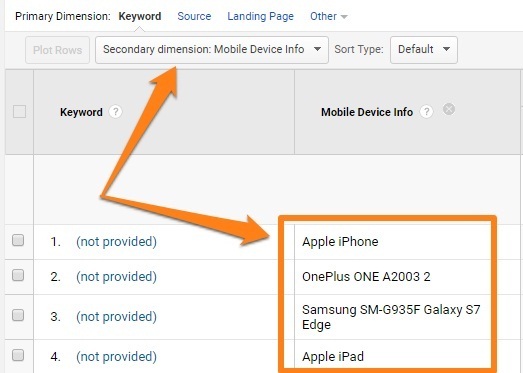 Then in the “Secondary dimension”, choose “Users -> Mobile Device Info” to find conversion rates by the mobile device. Your site is a combination of various content formats. For example, blog posts, videos, and sign-up form are all core components used on websites to make them dynamic and engaging. To understand how your audience interacts with each element, the event interaction report lets you track individual performance. For example, you can measure and compare a number of times users hit play on a video on your site as compared to clicking through to a blog post. Such insight reveals which categories and actions are more desirable for your audience and effective for you to invest in. The event tracking report requires you to first declare events you want to track, i.e. event tracking. Again, this topic is outside the scope of this article. Use this guide from Koozai to help you understand event tracking. Some plugins and tools such as a sharing button will automatically insert event tracking code into your site. To track these, go to Behavior -> Events -> Top Events. For instance, the report below shows that the “ShareThis” event was triggered three times in the defined period. ShareThis is a sharing tool, which means that the content was shared thrice in this period. Site load speed is a critical factor in user experience. A slow load time harms customer experience and causes people to leave your site. The report is organized by “average page load time” so you can instantly identify your biggest problem areas. Therefore, if a browser loads your site significantly slower than others, you are able to quickly prioritize patching to deliver an optimal experience. Doing so helps you plug leaks in revenue. This one is quite straightforward. Go to Behavior -> Site Speed -> Page Timings. You’ll see a list of your pages and their average speed as compared to the rest of the site. Asking the right questions alongside proper segmentation of data can reveal useful insight about your site and allow you take decisions that positively impact your business. Start by understanding the basic metrics and isolate them as highlighted by the custom reports above for maximum impact. Puranjay runs GrowthPub, a content-focused growth marketing agency. He also blogs about CRO, content marketing and growth hacking at GrowthSimple. When not nerding out over marketing, he likes to fiddle around with Ableton and his guitar. I just bookmarked this page for future reference whenever I am stuck with things! Most of these I was not doing, though would head right over and check them out now. Thanks so much for this really useful guide. 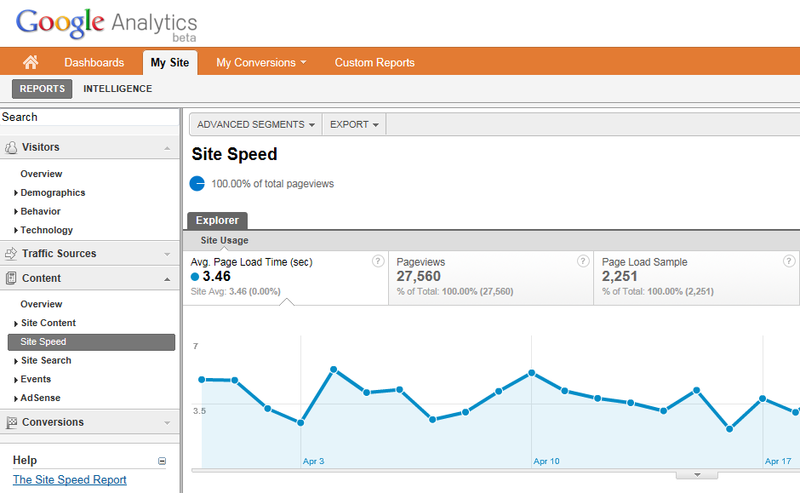 The Google Analytics Reports is great and we’ll definitely be making use of it.